Footwear Designer Silvia Fado is an innovative designer from Barcelona. She has recently worked on exciting projects that pushed the boundaries of fashion and led to her being featured in Dezeen, the magazine that architects love. Since graduating in 2014 from the prestigious London College of Fashion (“LCF”), where she undertook the Footwear Design MA, she has set up her own fashion business and creates exciting collections. Before her time at LCF, Silvia learned traditional bespoke techniques with artisan Paul Thomas. Silvia dedicates herself to extensive research into the comfort elements of footwear along with the more technical requirements, and the relationship between the movement of the body and fashion footwear design. She definitely makes footwear design come alive! Utelier spoke to Silvia to find out a bit more about the woman and designer behind the brand. I have always liked creative subjects, and after high school I studied architecture – but I soon discovered my passion for fashion. It was just inside of me – I can’t describe it but I was attracted to working in fashion, and so I decided to change direction. I finished my degree in fashion at ESDi School of Design in Barcelona, and secured an internship with Mango that turned into a job in the knitwear department. I worked there until I decided to follow my true passion, footwear. Footwear always has been my true passion, and I wanted to do it straight after finishing my undergraduate degree, but finding a good knitwear position delayed that. However, it was only a matter of time! When did you start your fashion business, and why? I founded my brand in 2014 when I finished studying for my Master’s Degree, I decided to go ahead when I saw that I had a different product that people liked. So I went ahead and start commercialising my shoes. Until recently, I was making bespoke shoes. However, I intend to start producing my new collection K4U [kinetictracesforyou] – which I presented in Paris this month – for a bigger audience. This new collection is a continuation of my previous collection, but I have developed my hydraulic heels in a more wearable and commercial direction. I am also launching my new line ϕ PHY for Spring/Summer 2016 with first the collection 3ϕ MONOCHROME. The aim of this new line is to be more competitive and to preserve my brand principles of introducing new technologies to fashion footwear. And then I am launching my online store in November 2015, which I’m excited about because I designed it myself, and also people will be able to buy easily and directly from me. I’m looking forward to welcoming my target customers: independent women who care about fashion and quality and who are looking for innovative and unique designs. What’s your earliest memory of wanting to involved in fashion? My grandmother teaching me how to sew to make my first ever dress, for my Barbie! Tell us about footwear design, what does it entail? It requires a lot of technical knowledge and practice, every time you make a shoe you learn something new, at least that’s the way that I feel. How creative can you be with the design and still have a functional shoe? You have to find the fine line between a great design and a wearable shoe, and I think that the best way to do that is to make prototypes and then to just make, make, make! As a designer, you know that some pieces are designed to be shown, and some pieces are designed to be worn. We designers/artists sometimes design things only to present concepts and ideas – something beautiful for people to look at – and in that case you can go as crazy as you want. However, when you design pieces to be worn, you have to make prototypes that are wearable so that it fulfills its purpose. For me, it starts in the studio when I’m experimenting with the materials and the ideas I have in mind. In my opinion, it is very important to know the characteristics of the materials in order to get the most out of them. I like that the material dictates its own function, and in turn, the function dictates its own design. My designs are always inspired by functionality – so during the process, one thing brings me to the other. Mostly from architecture, product design, industrial design, art, and sculpture. Normally I have an idea and look for related things to get inspired. I prefer minimalistic and functional design. What is the production process for your footwear designs? I make the prototypes myself and now I am starting to produce in Spain. It was a long and hard process to source my factory but I haven’t had any production issues so far. I chose my factory because they have a lot of experience, and they understand my designs. I also like how they work and the quality that they produce on finishings. At the moment I have a small space in my house that I have transformed into my studio. I have my things in there, and I have bought a 3D printer that does CNC milling and laser cutting too and that helps me a lot when I’m at the prototype stage. Expanding my brand. I plan on doing that by starting my second line, which will be more commercial. I am also exhibiting internationally and working on my commercial network (agents, stores, and distributors etc.) and e-commerce. I also put a lot of effort into my social media and communication with the press, bloggers, and stylists. What advice do you have for someone who wants to become a footwear designer? Work hard and follow your instincts! There are a lot of good books on shoemaking, I would suggest the ones about bespoke shoemaking for men’s footwear as they include all of the steps and are great for vocabulary too. It is good to have design books also, so that you have a good ‘shoe library’ to inspire you. 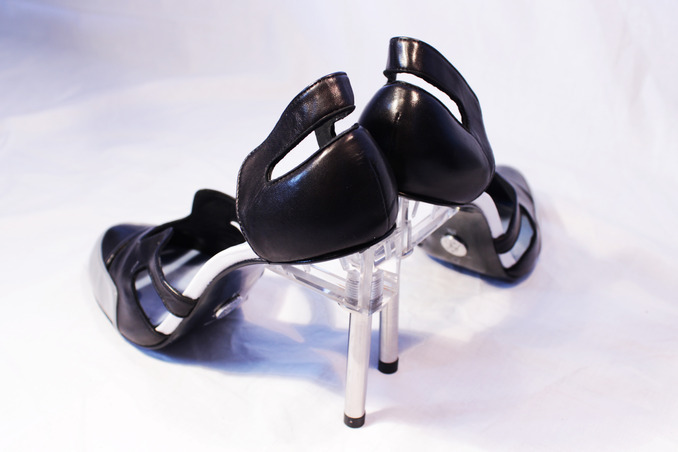 Footwear designer Silvia Fado can be contacted for freelance work and collaborations via her Utelier profile.